Feld Entertainment, a giant in the industry with the likes of Ringling Bros. and Disney on Ice among its productions, is moving into the empty GM facilities in Ellenton, and adding 235 jobs over the next five years. Salman and Wade Tatangelo grabbed the story after Manatee economic officials sent out a release at (grrr) 5:23 p.m. Monday. Today, Salman had barely started his day when he found the news that ISPG, a specialty medical manufacturer, is building its new global headquarters in Lakewood Ranch. 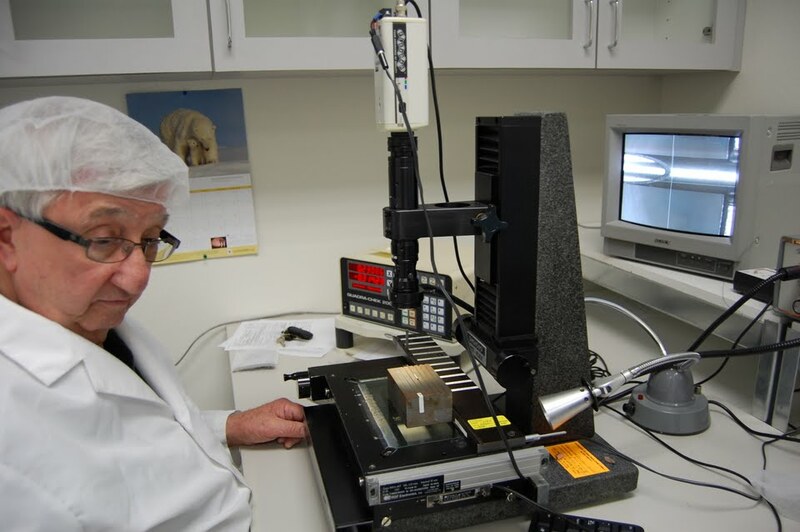 That family-owned firm plans to add 25 more jobs in the next few years, and is investing $1.6 million in the expansion. Most things are about politics today, as the top two GOP candidates make their last blitz through Florida for Tuesday's primary. A last-minute West Coast visit from Newt Gingrich, as noted in Marc Masferrer's political blog, has us switching gears on reporters' assignments. In a partnership with the Miami Herald and our Washington bureau, we've committed the Bradenton Herald staff to cover from the Hillsborough border down to Fort Myers. Yep, Newt picked Fort Myers on the last full day of campaigning before the presidential primary. So reporter Richard Dymond is heading that direction. 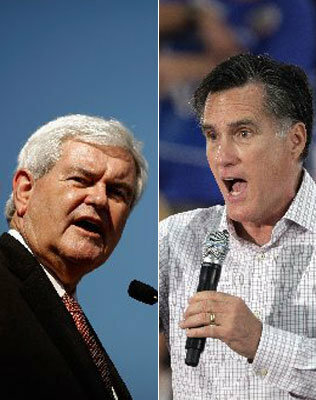 After a 1 p.m. event at Tampa International Airport, Gingrich will fly to a 3 p.m. rally in Fort Myers. From there, he will fly to Orlando for a "Crossing the Finish" line rally. Follow Rich on Twitter at @RichardDymond and check Bradenton.com for updates on polls and breaking news throughout the day. Mitt Romney, who has not campaigned at all in Manatee or Sarasota during the past 10 days, will spend today in Jacksonville, Dunedin and The Villages. Newsy day here in Bradenton -- and in the Bradenton Herald. Gov. Rick Scott flew in specifically to meet with our editorial board. He spent an hour discussing a wide range of topics, including economic development, jobs, merit pay for teachers, health care, the port and lessons learned from his first year in office. Herald photographer Paul Videla photographed the governor, while East Manatee Editor Jim Jones shot video. But Metro Editor Marc Masferrer threw him the question that made for the most interesting headline out of the discussion: Who did he plan to endorse in the Florida GOP presidential primary? "I haven't made a decision, but I'm leaning towards not to do it," Scott told us. Great fodder for tweets, a breaking news story, Facebook and political blogs. Talk about multi-tasking. And Jim produced a great video grab from the entire discussion (see below). And then the governor held his scheduled press conference on the state's unemployment rate dropping in Florida from the Herald. Business reporter Josh Salman dropped the conference call and grabbed the story live. Their mini-profiles on the blog alone make it worth a visit. In their first few blogs, they give sharp, personal insight to their vantage point behind the lens. In many ways, "Through the Lens" turns the camera around for treasured snapshots of the Herald's photographers. I hope you'll enjoy the view. Editorial Page Editor Chris Wille opined today on Realize Bradenton's waiting-list-only luncheon this week, where 180 civic leaders, activists and students gathered to talk about 'what's working' and 'what's next' for Bradenton's cultural success. The group, as Chris notes, was diverse in both age and ethnicity, reflecting the ongoing, deep community engagement in Bradenton’s future. I think it was one of the best cross-sections of Bradenton's community leaders that I've seen gathered in a long time. 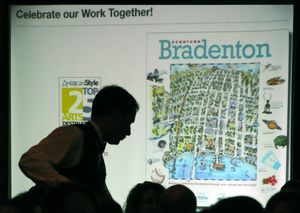 The brainstorming session was sponsored by the Knight Foundation, one of the key reasons Realize Bradenton even exists. (Here is a sampling of Grant Jefferies' photos from the luncheon.) From the years when Knight Ridder owned the Bradenton Herald through now, the Knight Foundation has considered Bradenton one of its key communities. Dennis Scholl, vice president of the arts for the foundation, was the luncheon's keynote speaker. And he threw down the gauntlet for Bradenton to ramp up its cultural efforts. We should be known across the country for our collaborative efforts, he told all of us. Well, it looks like he might really help us get there. Johnette Isham, Realize Bradenton's executive director, sent Scholl a link to the Herald's editorial. His response was packed with praise for the coverage, and for Bradenton's effort. "Wow, they really got it," he wrote Isham. "I’ve sent this to the chair of the NEA (National Endowment for the Arts) and the head of grantmakers in the arts..."
We predict: They are going to love this community. Both stories involved 21 or 22 students. Both unfolded at the same time yesterday evening. Our night reporter could only cover one. And I had to put away iPhone, laptop and any other means of communication to focus on the other story. Talk about a challenge. Every year, I have had the honor of joining the judges of the Martin Luther King Jr. essay/speech contest. The passion and determination found in those speeches continue to amaze me. This year's 22 finalists were no exception, as the sixth- through 12th-graders took the stage one after the other in front of more than 100 friends and family (and the five judges!). But at the same time these 22 students were wowing us with their speeches, another 21 students -- classmates of some of the contestants -- were being rushed to area hospitals after their school bus crashed into a tractor-trailer in East Manatee. Before I had to turn off all ringers, their conditions were still unknown. Thankfully, all injuries were minor, and the school district appears to be doing everything possible for the families involved. 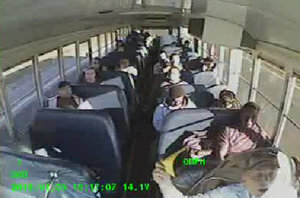 One of our stories today captures on video just how terrified the students were. So we can praise our MLK winners without fears for their fellow classmates. That truly is a cause for celebration. Here's a link to all the winners, and we will publish the winning entries on Jan. 15 in the Bradenton Herald.